Although pictures on ebay listing doesn’t show them having Sega written on them, the ones I got have it. Probably the way to avoid problems with unauthorized usage of Sega logo 🙂 . As I mentioned they work out of the box and some people just connect them and at least for some time there are no problems. 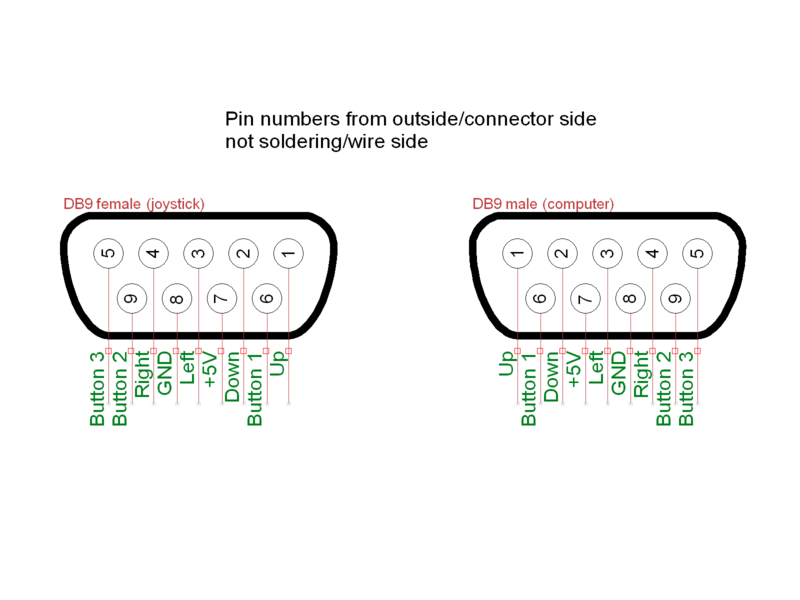 Main problem is that pinout is not the same, mainly +5V pin on Sega controllers is number 5, on Commodore, or better said Atari, pinout it should be on pin 7). When we press a key on classical, let’s called them original, controller pin that’s tied to that function get’s connected to the ground, or GND line as it’s called for short. There isn’t any kind of electronics involved in controllers. There is exception to this rule and that is controllers with autofire function. They had a chip that, understandably, needs power to work. User would only have to keep the button pressed and chip would take care of simulating rapid presses. It’s not important in this case, just FYI 🙂 . In regard to vintage computers these gamepads have few problems. 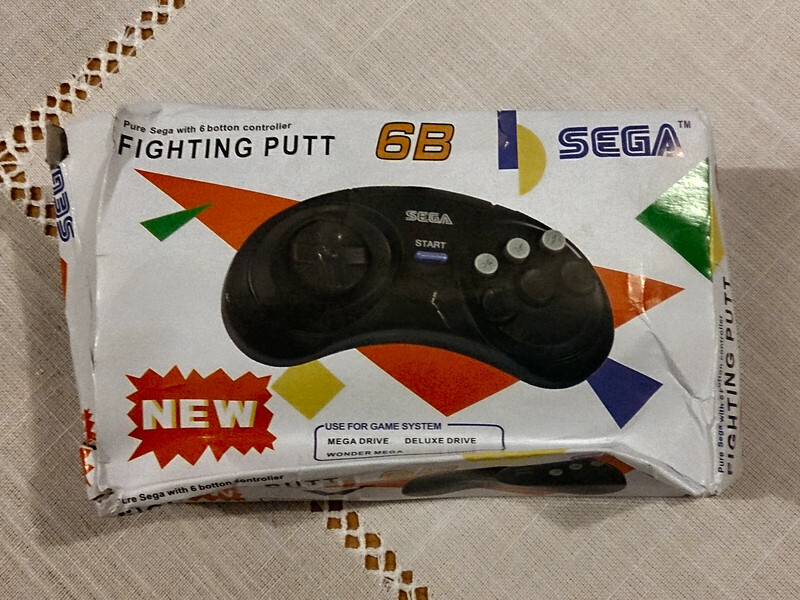 There’s already mentioned power on the wrong pin, and then there’s the fact that this Sega gamepad has 6 buttons. There isn’t enough pins to allow this and movement. Unless there’s some kind of chip that works it’s magic. And to make long story short, there is. 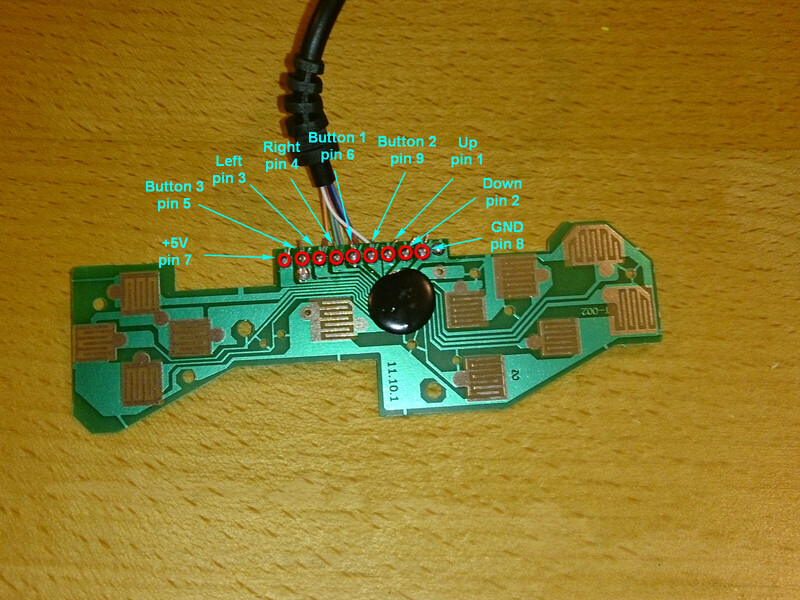 There’s a 74HC157 multiplexor chip that “encodes” these buttons so they can be differentiated by Sega console. And that also ties with first problem of different pins used for 5V, it will send signal to lines where there should be any voltage on original controllers. 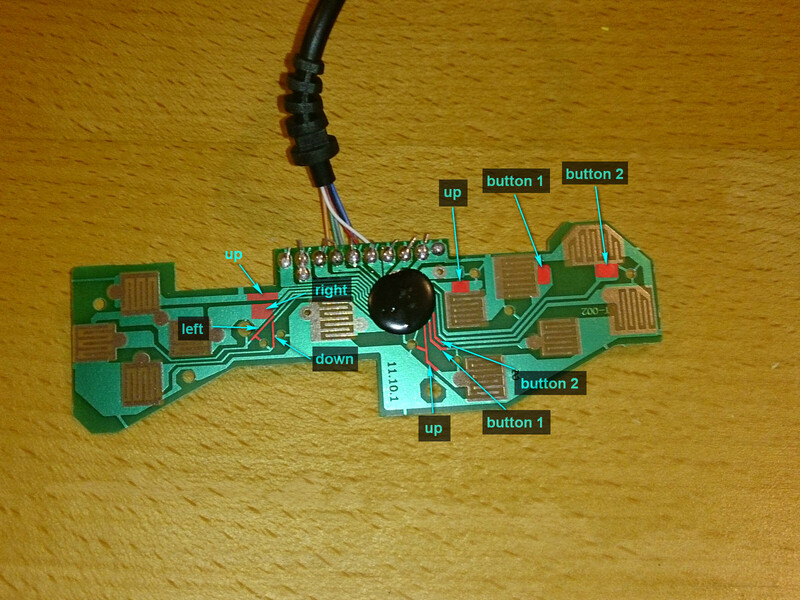 And all together that’s what will fail C64 if these controlers are used as is. As far as I know Amigas don’t die, there’s probably some overvoltage protection on her lines, but I wouldn’t rely on that. When we open gamepad case we get to PCB inside it. Nothing much, just contacts and chip hidden under this black epoxy. Since I got two of these gamepads I tried to remove this epoxy on first one. At first I’ve tried to pry it off with x-acto knife and tear it off bit by bit, but it’s to hard. Next I tried to sand it off with Dremel, but after sanding down layer by layer I eventually got to PCB, newer saw the chip. I guess it’s simply too small so I gave up on sanding. On this one I simply cut the leads that go in it. It’s isolated from the rest of the board, plus it’s way less dusty 😛 . This is how connector pins are connected to PCB. 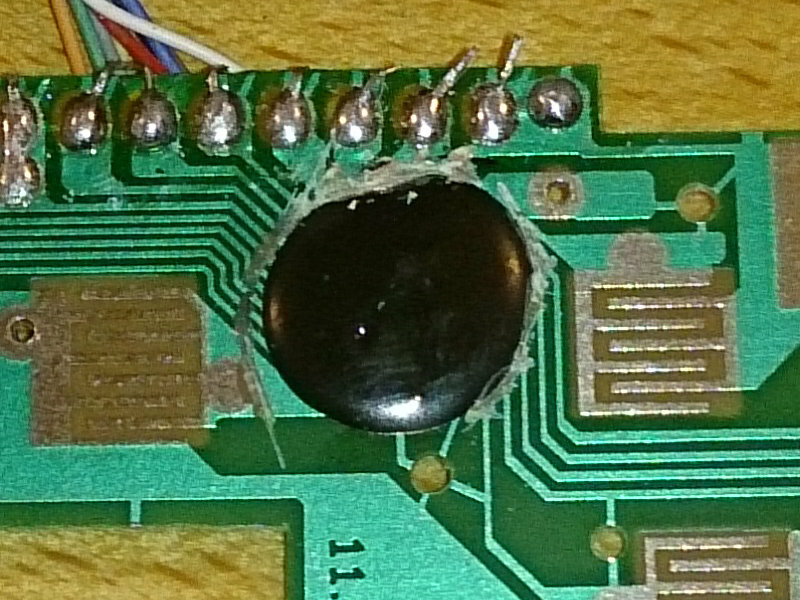 First step is to isolate this chip from the pins. You can use any sharp knife you’ve got, x-acto knife, scalpel… Start slow and don’t pres hard. It’s better to go over them more times than to break the PCB. It’s best to cut as close as possible to the chip, that way we’ll have more space to solder later on. This is how it turned out in my case. Left side veered a bit away from the chip, but that’s select button which I won’t use anyway. Important thing is that it has no connection with the chip. Now that the chip is out of the story it’s time to prepare for soldering. GND plane already goes around the PCB so we don’t need to worry about connecting that, we only cut where it connects to the chip, we only need to connect signal lines. We have 6 buttons on our disposal. In most cases C64 uses only one fire button, in case of the Amiga there are games that can use two buttons. It is possible to connect third button, but I don’t know of any game that uses it. I think I read somewhere that Adoom has support for the third one but only with some kind of adapter. Anyway, nothing important for me. So, it would be nice to have two buttons. 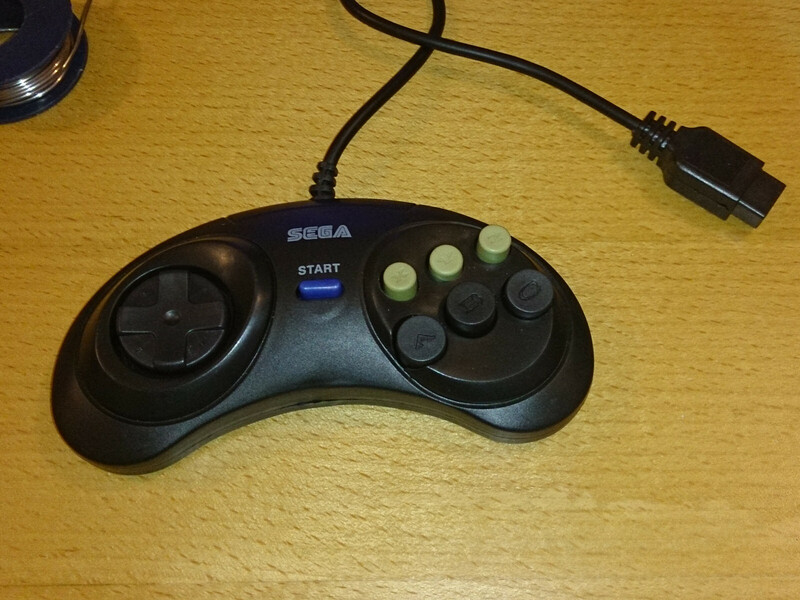 Since this is not a joystick, but gamepad, in some games it could be tricky use d-pad to move left or right and press up at the same time to jump. So it would be good idea to have “up” function on one of these buttons. In the end this is what I ended up with. D-pad for up – down, left – right, first button from the left is up, second is fire button 1 and the third one is fire button 2. Since we have 6 buttons, and not to leave them unused, I duplicated these function on the second row so it doesn’t matter what button you press. This is where I’ll solder wires for these functions. This leaves us with only one more task to do, soldering the wires. First we need to strip insulation from areas marked with red color. It’s easiest to do with something metallic, like already mentioned x-acto knife or scalpel, just gently scratch it off. Again, not too much pressure so we don’t damage lines below insulation. After it’s scratched clean it with alcohol or acetone and add little solder to these points. I strongly recommend soldering flux for this part. Without it you’ll probably have hard time to get solder to stick. After all of this it should look cca like this. Instead of soldering to these thin lines we could use this areas next to button contacts, like in the case of three upper buttons. But over these contacts comes rubber contact pad. Every time we would press it we would press on both these points and wires. This would increase wear and tear of these rubber pads and in time probably both wires and solder points. Plus, we would need to think of a way to immobilize the wires so they couldn’t get under these contacts and block them. 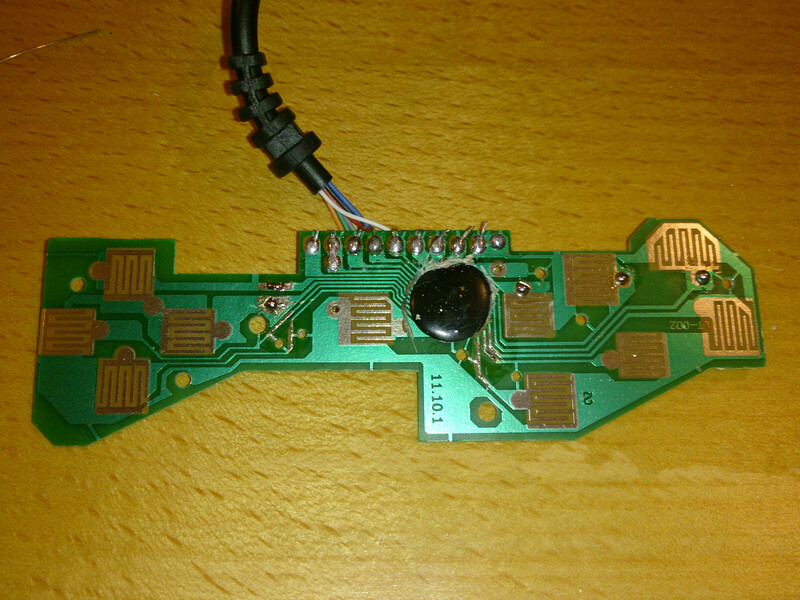 All in all, easier to solder, but more problems in the long run. Three upper buttons probably wont get much use so it’s not that important in their case. For connecting these points with upper contacts I used so called kynar wire. It’s really thin isolated wire, 0.25 mm thickness or 30 gauge wire (30awg). Often used for soldering console mod-chips. I decided to use it because it needed to be soldered on directly on thin PCB traces and I’m not sure if thicker, heavier, wire would successfully stick on them. You can’t really add too much solder to them to make it more durable. Also, I noticed that solder on these upper contacts is kinda strange. When I tried to heat it up with soldering iron it would become brittle and crumbled away instead of melting. I suspect this is because of ROHS standard. It forbids usage of lead in soldering wire. Solder without lead requires higher temperature to melt. 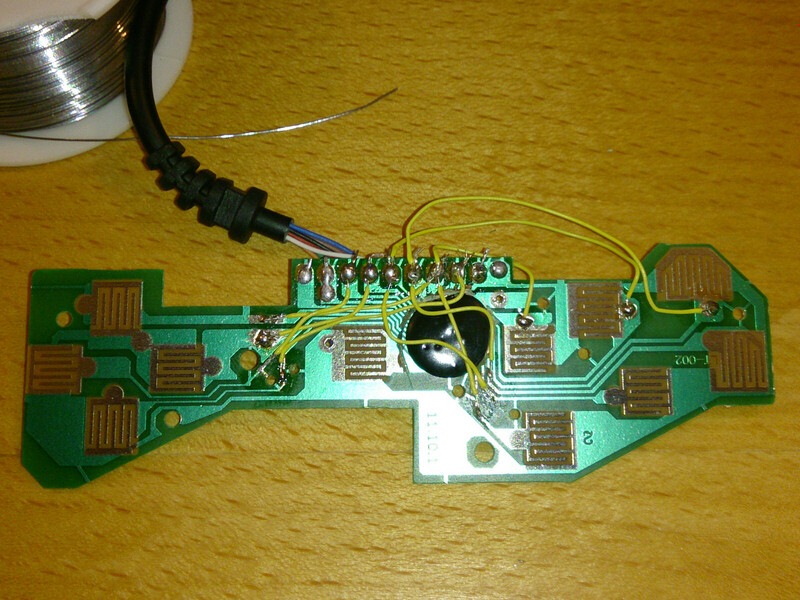 In the end I decided it’s better to remove it and replace with my regular solder. Half a minute of work and we’re done. Now just to put it all back in the case and test it. Before closing just check that little wire tails on upper contacts don’t cross. In my case few of them were long and touched their neighbours. You can just fold them under the PCB and leave it that way or snip the excess. There’s only one more problem, but it’s not due to modification. Cable on these controllers is (in my opinion) extremely short, about 80 cm. But that can be solved with extension cable. That will be one of the next articles. Posted on September 21, 2014, in Amiga, Atari, Commodore, DIY, Retro computing and tagged Amiga, Atari, Commodore, gamepad, joystick, modification, Sega Genesis gamepad, Sega MegaDrive gamepad. Bookmark the permalink. Leave a comment.